Recently, I had the opportunity to sit down with Arturo Schwartzberg, Cofounder, CFO, and Chairman of SweetRush, to gather his insights from having managed and grown a virtual company since 2009. I was particularly interested in exploring this virtual team’s success factors. Below are the questions I posed and his responses. Enjoy! How did SweetRush become a virtual company? Was that part of the vision early on? While we’ve made many intentional decisions that have moved us along our path, we can’t take credit for the decision to go virtual, which really was a function of necessity. Starting in 2001, we’d built the company step by step until 2009, when the economy took a decided downturn. Our office was in San Francisco and our rent was extremely high, and so at that juncture we successfully negotiated to exit our lease. And we went virtual. By the time we started to rebuild, we’d embraced working virtually, and it stuck. What two or three decisions did you and Andrei [Hedstrom, Cofounder and CEO] make were central to your virtual team’s success factors and allowed you to build a strong virtual team? If there is one thread that has defined us, perhaps the ultimate virtual team’s success factor, it’s been a focus on a culture of caring and teamwork—and our culture encourages and enables each of us to do what’s right for our teammates, clients, and, when we get lofty, even for the planet. If we did not have a strong culture, we’d never survive as a virtual team. Not sure you could define that as a decision, but it’s just the way Andrei and I see the world and the way we wanted to grow SweetRush. Another aspect of how we grew SweetRush both enabled us to go virtual and also was enhanced by being virtual, and now I am referring to being obsessive about only hiring superstars. We’d always had that orientation, but when you are virtual you can only bring on people who are self-motivating, people who are committed and care. 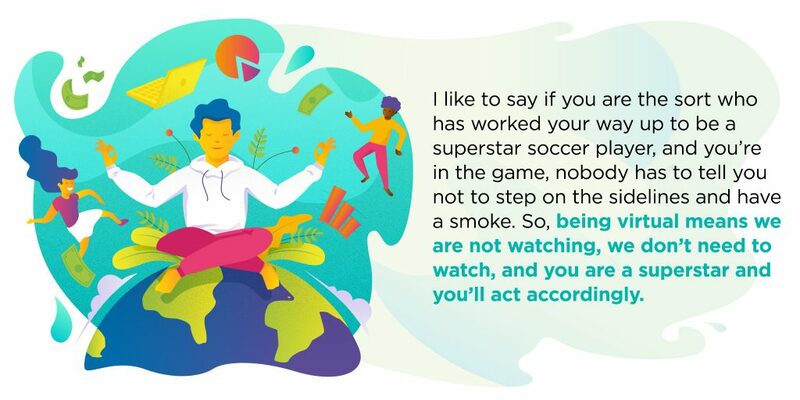 I like to say if you are the sort who has worked your way up to be a superstar soccer player, and you’re in the game, nobody has to tell you not to step on the sidelines and have a smoke. So, being virtual means we are not watching, we don’t need to watch, and you are a superstar and you’ll act accordingly. Simply put, hiring right is a foundational and essential success factor for a virtual team. Some of the key success factors of teams in general are having cohesion, trust, and a shared sense of purpose. How do you cultivate that in a virtual team? These are good questions, but my fear is all the answers will start sounding the same since so many aspects of being virtual revolve around culture. I guess you could say that it really doesn’t matter if you are virtual or not, the virtual team’s success factors are often the same as any team success factors; which is to say the focus on culture, which fosters cohesion and trust, remains the same. Are you honest with your team, do you treat everyone respectfully, do you shout out credit, but don’t shout otherwise? Do you foster open dialogue, do you really try your hardest to help everyone be successful? This is the culture stuff, virtual or not, and these are things we try very hard to do—and to do better all the time. Perhaps in an office setting, a toxic culture would be unfortunate and not the best formula for success, but in a virtual company, I think things would unravel quickly without the gravitational force of a positive culture holding people together. OK, let’s ask a different sort of question, maybe a softball question, but what do you consider to be the benefits of being virtual? Softball maybe, but I do passionately believe in the benefits, and they are profound; so, happy to go there. Being virtual has some downsides, but—wow—the benefits! Perhaps top of the list is that the world is our labor pool. In our Talent Solutions service we place temporary talent, and perhaps the first question we ask a client is if the position can be remote or must be on site. It’s the number-one fork in the road, and if the answer is virtual, that road just became a whole lot easier. Finding talent in one location versus anywhere—or perhaps anywhere in a reasonable time zone—is so much more challenging. And of course, different geographic regions have different pay scales, so talent can be found that is more cost effective if you can source country- or worldwide. From the start, even before going virtual, we had a global mindset and had opened our subsidiary in Costa Rica, where we had an office as we did in San Francisco. When we went virtual and shed all our offices, we threw off all geographic boundaries. And now we have teammates throughout the globe, though our greatest concentrations remain the US and Costa Rica. And there are the functional benefits. Of course, we don’t have to pay for an office, and removing commute time from your team, when you do the math, the time savings is profound. And not only is the world our talent pool, but so many folks just love the idea of working from home, being able to integrate work and life, so this attracts talent to us—and in the market today, attracting talent is a key competitive advantage. All of us—virtual or not—work so long and hard, it’s sad we have to compartmentalize and spend the better part of our time at work, and life exists on the edges. When you are virtual, it’s up to you to frame how you conduct your time. 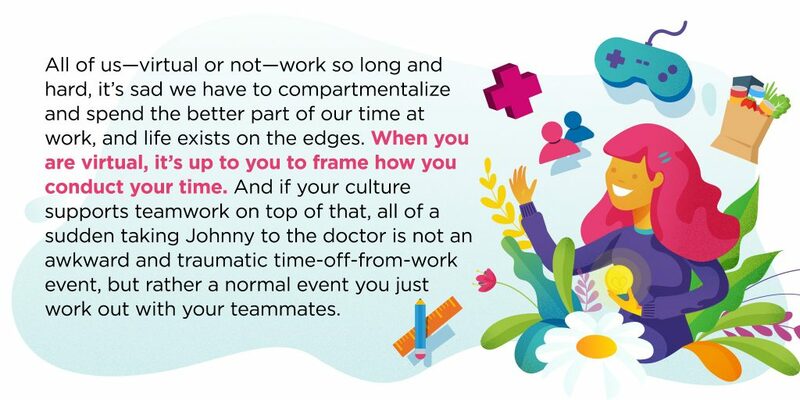 And if your culture supports teamwork on top of that, all of a sudden taking Johnny to the doctor is not an awkward and traumatic time-off-from-work event, but rather a normal event you just work out with your teammates. Everyone understands and is going to lend support, scratching your back this time, knowing next time you’ll scratch theirs. So, what we have called virtual teams success factors also wind up being a huge attraction for potential employees. And as mentioned earlier, it really does sharpen your sense for who is a self-motivated superstar, knowing that anything shy of that caliber will not be the right fit. Honing that spider sense is a real skill we’ve cultivated and it definitely has enabled our contingent staffing service to excel. Finally, I’ll say that we continue to grow our business geographically, and our capabilities working with talent globally facilitates our ability to expand. OK, you mentioned there are downsides, and I’d be remiss in not asking. Can you speak to them? I can think of two, thankfully both of which can be overcome with some effort. Recently, I had the opportunity to meet face to face for breakfast with Ashley Munday, who heads up our Cultural Transformation services. I’d worked with her for over a year, spoken often and connected many times via video conferencing, and yet, just that hour-long breakfast shifted our relationship in a very positive but hard to describe way. I’m sure there are others more erudite on this subject; maybe it’s touch, smell, chemical, but there’s something that happens when humans meet in person. Salespeople know this and it’s why they road-trip to meet clients. The good news, however, is that this does not need to be an everyday event, and even that one meeting has shifted our relationship and created the connection. So at SweetRush, we encourage and support groups of teammates getting together. We created what we call the “Magic Map” that shows where everyone is located to facilitate those touchpoint moments and we consider these get-togethers a key success factor for our virtual team. If most of your team is located in one geographic area, such as our team in Costa Rica, then getting together is easier and we do so there more often. The other downside is that there are moments when I’d love a group of people to be in a room brainstorming, with whiteboards and sticky notes. But after you get acclimated to working remotely and use all the tools coming online to facilitate remote working sessions, this becomes more of a like to have and not a need to have. What do you look for when hiring new team members to join a virtual team? I think we pretty much discussed this prior, but I’d just like to add a bit of commentary. I talked about us seeking the superstars, but not everybody has either manifested this trait yet or been given the license and encouragement to be the superstar they can be. Seeking talent has been one of my passions over the years, and I think our team has a strong radar for unearthing talent that, in the right environment, will shine. 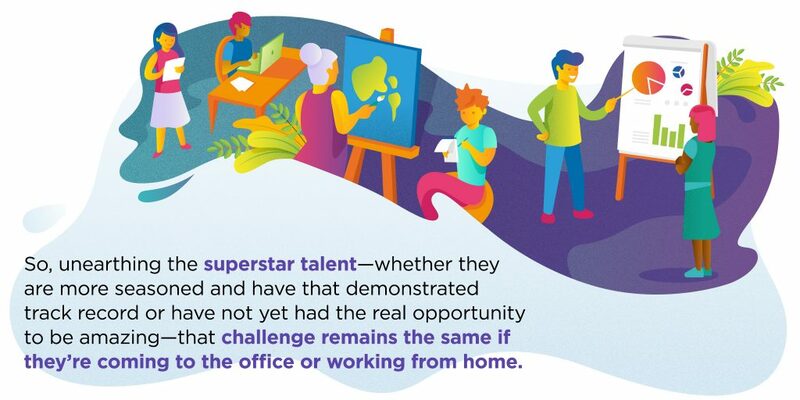 So, unearthing the superstar talent—whether they are more seasoned and have that demonstrated track record or have not yet had the real opportunity to be amazing—that challenge remains the same if they’re coming to the office or working from home, and yes, finding this talent is a virtual team’s success factor. Once again, surround them with superstars, put them in that environment where they will be supported, but a high level of performance is expected, and I think most people, if they have the innate talent, will rise to a new level and love it. As far as the sort of logistical transition, well, maybe we are just good at it. But from my experience, most people will adapt well to working from home, and once they make that transition, they can’t imagine going to the office daily for the traditional 9-to-5. 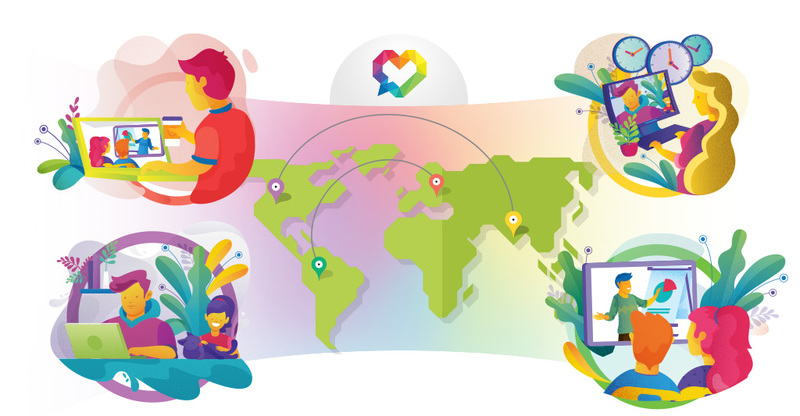 What are some of the growing pains you experienced as the SweetRush team grew from about 20 virtual team members to now over 150 in over 12 countries? How did you overcome those challenges? I think the issue of growth and how you maintain the culture, how you keep the personal connections is challenging for all organizations, and somewhat independent of being virtual or not. There is a stage in a company when the founders or key personnel are no longer aware of all things, and others need to be making independent decisions. Somehow, you need to instill everyone with the company values and direction so they can be making those decisions in a way that is aligned. I suspect this challenge may come sooner for a virtual company versus a brick-and-mortar company, and I think we experienced this moment when we hit around 100 people. If we were in an office, perhaps this would have come a bit later in our growth. Other than handling this transition—which is an important one—I don’t see any other real issues specifically related to being virtual and growing. Well…having said that, in parallel with this transition was our transition to enterprise-wide tools, such as a CRM, a talent database, a consolidated project management and hours tracking tool, etc., and this, too, enabled our being virtual, but also, again, it’s a logical progression for any company, virtual or not. How do your clients benefit from working with SweetRush’s virtual team? Good question. The net of it all is that because we attract and keep great talent, our clients are the recipients and beneficiaries of the efforts of that talent, and that, ultimately, is all they really care about. In general, we’ve always had an extreme focus on project management, and I think this is important—being virtual or not. But because of this orientation, clients experience a high level of communication and a very coordinated effort. But these things, honestly, are really not necessarily a function of being virtual. Our clients are everywhere—not in any one geographic region—and there is no need or benefit for clients to visit us in an office. In fact, most of our clients themselves have teammates in different geographic areas. When there’s a need to be face to face with clients, it always makes sense to do so at their offices. I cannot recall a time when a client wanted to meet at our office or was disappointed they could not. Our clients are located in various time zones—as is our team—so that works out. In general, however, I think the issue of being in an office, or remote, for the sort of work we do is of no issue or consequence for our clients, all of whom we connect with digitally or via audio or video conferencing, exactly as we would if we were in an office. And finally, as I mentioned, almost all of our clients have dispersed workforces, be they remote or just geographically dispersed. Often times clients have been excited to leverage our expertise as we are adept at communicating to a diverse workforce. eLearning, almost by definition, has emerged because today’s workforce is so dispersed, hence our true understanding of this reality has proven many times to be a benefit to our clients. For those who are just starting out building a virtual team, what’s one piece of advice you’d like to share? I would say, “Go for it.” It may feel awkward, counter to the way things have always worked, but it will force upon you a mindset that will serve you well in the long run. It’s interesting that just about all the virtual team’s success factors turn out to be an advantageous mindset that is a great perspective to growing any team. 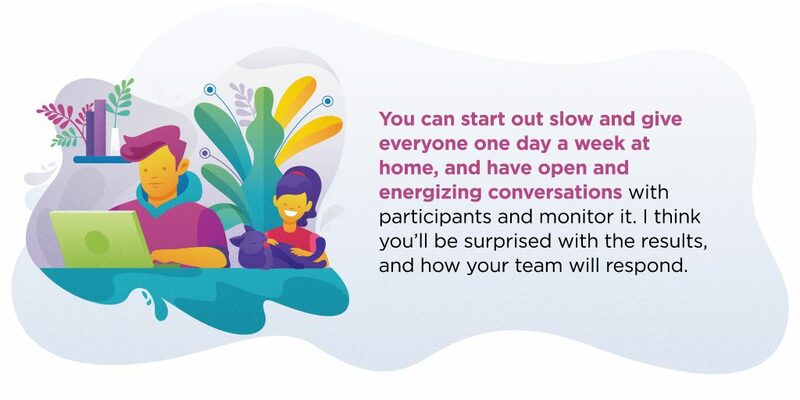 So, I suggest you start out slow and give everyone one day a week at home, and have open and energizing conversations with participants and monitor it. I think you’ll be surprised with the results, and how your team will respond. Of course, you’ll need to make sure everyone is enabled for success—which means they have good internet and appropriate monitors, essentially emulating what they have in an office. Depending on the work your company does and the role your people play, there may be IT- and security-related issues you’ll need to check on. And now that they are remote, is everyone enabled with the right sort of communication modalities for video and audio conferencing. And finally, is everyone clear on their work, what they need to accomplish. For most of us, traditionally, when we are home during work time, it either means we are sick or for some reason not working, so to shift this mindset it’s important everyone clearly understands there are things they need to accomplish. It’s a work day and they have a mission. This is the mindset shift they need to make and making sure they’re clear on what they need to do will help them in this transition. So, again, try it out. Any change takes some effort, but it’s worth it! For computer-based, digitally connected workers, I strongly believe this is the future. I think holding out to a 100% in-office mindset will increasingly be a competitive disadvantage. 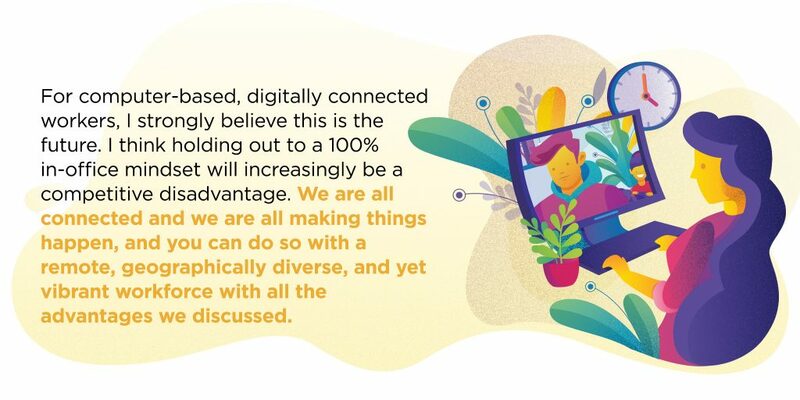 We are all connected and we are all making things happen, and you can do so with a remote, geographically diverse, and yet vibrant workforce with all the advantages we discussed. Even if your workforce is all local, giving your people the right and freedom to work from home part time shows you trust them, allows them to integrate their lives into their work, and I think you’ll experience more productivity and appreciation. Going completely virtual as we have requires the culture to support it, so you have to ask yourself if you have that culture or can make that transition. True confession: We are about to establish an office space in Costa Rica to house our SPARK team—which focuses on virtual reality and emerging technologies—because we need a physical space for equipment. But the people on that team will only need to work on site to the extent they need access to equipment. We’re securing a space large enough as well so that others on the Costa Rica team can go in from time to time to meet up with teammates and enjoy all the comradery and bonding that being face to face enables. Working from home allows me to split my time between San Francisco and Costa Rica, where I am now, sitting at home surrounded by greenery, my dog nearby, ready to break as I chose, yet of course knowing that I need to get the job done, and I will. I could not imagine going backward, commuting and compartmentalizing work and life. SAN FRANCISCO, CA – SweetRush has been included in TrainingIndustry.com’s 2014 Watch List for Content..
SweetRush was awarded the 2012 Brandon Hall Excellence Gold Award for Best Use of Games.. The award highlights SweetRush’s ability to fully leverage all technology-based modalities in the creation of.. List recognizes best companies creating “high impact and super engaging and immersive e-learning courses” SAN.. The award recognizes an expanding and evolving learning program for Bridgestone that leverages several technology-based..